Interviews can be incredibly stressful and trying, regardless if it is for a dream corporate job or meeting with a family who is interested in you caring for their kids. The best way to overcome these feelings is to make sure you are prepared for your interview and the numerous questions you most likely field about your experience, your personality, and your personal life. The better prepared you are, the better chances you will come across to the family as being competent and ready to be a trustworthy person to care for their children. Remember, even if you have all of the qualifications that are on their list, not performing well during the interview could impact you getting the job. As a parent, I have interviewed my fair share of sitters – I think I have a pretty good idea of what to look for when I’m sitting across from a new sitter. 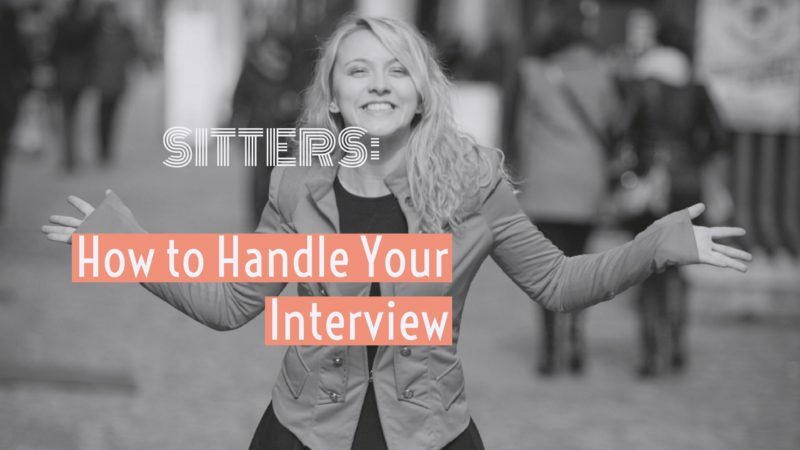 Here are some of the more important things parents look for when they are interviewing a sitter – nail these, and you should have no problem impressing parents. Just wanted to confirm our interview tomorrow at XYZ Coffee at 10am, really looking forward to meeting you and hearing about your family! Don’t feel like you are bothering the parent, this will really put them at ease that you are organized and reliable. There is nothing worse than scheduling a sitter and being worried if they are going to show up. This always seems like the most obvious tip, but surprisingly gets overlooked quite often. 5 minutes late to an interview may not seem like that big of a deal, but most parent’s top thing when looking for a sitter is reliability. Make sure you are early to the interview, get there 10 minutes early – catch up on some emails, texts, or go over some notes you’ve made when preparing for the interview. If you are meeting at a neutral spot (other than the family’s home), get a table and give yourself some time to get comfortable. Looking relaxed, organized and situated when the parent walks up can really go a long way with a first impression. This isn’t an old-school job interview, so you don’t need to be super dressed up, but on the flip side, you want to look tidy, so don’t dress like you are heading to a night on the town, or look like you just rolled out of bed. You can always discuss what attire is expected when you are sitting, they may be fine if you are in super comfortable clothes to be playing with the kids, but definitely not for the interview. This doesn’t mean to not be yourself – never put on an act to try to be something you aren’t, that will be sniffed out very quickly. You want to make an immediate good impression with whom you are meeting. They aren’t looking for you to be acting like you would with the children – no babytalk, or silliness is needed at the interview. Focus on showing your mature and responsible side – be as polite and friendly as possible. Even if you have all of the qualifications in the world, if you come across as uninterested or disengaged, you will probably not get a callback. Everyone appreciates honesty and openness. If you are presented with a question about something you don’t know, or don’t have experience with, don’t try to cover it up or pretend that you do, because it will only hurt you. Just because you don’t know a specific children’s author, or new parenting technique doesn’t mean you won’t get the job. Show that you are eager to learn and absorb new information, parents will value that in the long run. Never agree to hours or days that you can’t fully commit to, this will just let down the family in the long run. Make sure you know as much as possible about the person/family you are meeting with before the interview – this will help you prepare better for the interview. How many kids are there, what are their ages? If they are toddlers, make sure you are familiarized with books, videos, or activities that are relevant to them, this will most likely come up at some point. Have some ideas ready of what you would do with the kids if you were watching them – get creative, this will earn you tons of points if you can present a scenario where the children are having fun, learning and doing something safe. If you are at the family’s house, or the parent(s) have brought the children, make sure to show you are comfortable with interacting with them. Even if it is a hello when you see them, some smiles or tickles and a nice goodbye, it is good to show you can connect with children. The interview is still about you and the family, so don’t completely get wrapped up in the kids, but don’t ignore them either. Remember, even though the kids aren’t checking your qualifications or references, they still have a vote in the process!